The airline industry has a turbulent past. Buffeted by uncontrollable external input costs and regular assaults on traffic demand, it has rarely achieved even modest profitability. Where profitability has occurred, it was usually at the expense of traffic growth, inhibited by protectionist regulation. Yet, over the past two or three years, almost every facet of the industry has excelled. Profits are at record levels, load factors are high, yet traffic growth has grown off the radar. The year 2017 has arguably been the sweetest spot for combined airline profitability and traffic growth ever experienced. 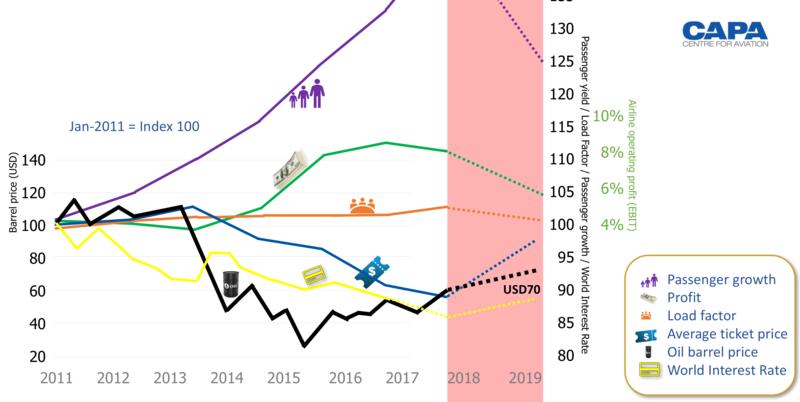 Basking in globally synchronised, if modest, economic growth, with historically low fuel prices and interest rates, airlines have lowered fares, in the process adding extra stimulus to passenger traffic growth. Now the core ingredients for the future of this phenomenon may be at risk. Rising oil costs will stall fare decreases, dulling demand in what has become a highly price sensitive market. And interest rates too are gradually increasing. If, despite growing political uncertainty, global economies continue along their current track, any descent from this unique sweet spot may be softened. Much will depend on how far oil prices rise. On 26-Dec-2017 the Brent Crude oil price per barrel first rose above USD67, the highest level for over two years. The immediate cause was an explosion of a pipeline in Libya, but that does illustrate the potential risk inherent in a Middle East that is probably more unstable than at any time in the past decade. As an important – and uncontrollable – input cost for the airline industry, it is a development that will be noticed widely. IATA’s projections for 2018, as recently as 7-Dec-2017, relied on an average Brent Crude price of USD60 in 2018 (with actual jet fuel prices about USD14 higher). With the price already 10% above that level, and only a few days of 2017 left, adjustments will be needed. Whether the rise proves to be the continuation of a trend, or to mark the peak of pricing, is likely to define the course of the airline and travel industry in 2018. The airline industry is a very special business. Every business is different, but in a number of ways airline commerce is unique. This results from a number of factors, the most important of which is the archaic system of regulation that distorts international airline operations. What this means, in turn, is that every country is a substantial source of supply, as well as being consumers of the airline product. That means every country has at least one “flag carrier”. In many cases the government will have a very substantial interest, if not total ownership, of that airline. That alone should be sufficient to indicate why the natural flow of supply and demand is distorted. The fact that a government wishes to own an airline, and that travel is so fundamental to international trade in one form or another, means it would be foolish to assume that normal market forces govern the industry every step of the way. What’s the implication of that? – quite simply, that it will often be the case that supply leads demand. Add to that a whole emerging new market in Asia, and the expansion of a lot of new airlines vying for a place in the market, and you have the underpinnings of a constant oversupply of capacity, wherever there are open markets. 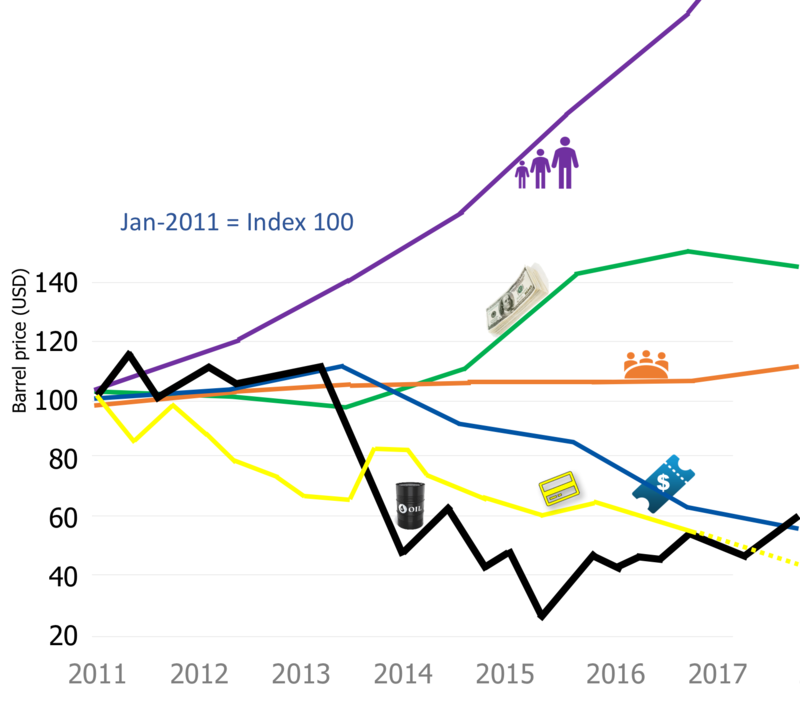 All of the typical economic forces like GDP growth, business confidence, trade flows and the like will have a necessary impact; but just projecting the future on the basis of those features would not be sufficient to explain why the industry has been growing the way it has over the past two years. To take one example, there has historically been a fairly predictable relationship between GDP growth and traffic; that is, traffic will tend to grow at about one and a half times the rate of GDP growth. At the moment, there has been fairly comfortable synchronised growth among most economies of the world. While none is particularly strong, most are growing steadily. That said, it would be fair to expect the pace of passenger growth to be around 2 times GDP growth. So how does that explain that we’ve been experiencing growth, not at a multiple of 1½ to 2 times, but of as much as five times that level? That’s the starting point. Importantly, short term forces – and there are many of them – can also greatly influence market growth. So, while the so called long term growth average of the industry is around 4% annually, there are many internal and external factors that can stimulate much higher (or lower) growth in the short to medium term. 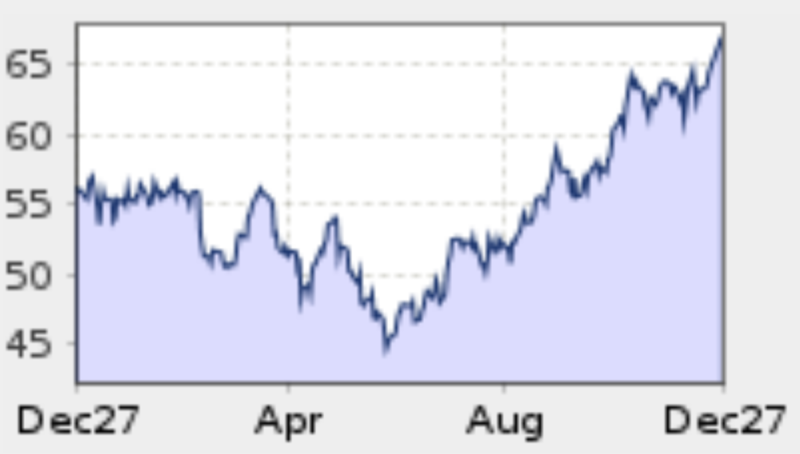 Most recently, one of the biggest short term influences has been the large fall in the price of oil. When oil prices were around USD80 per barrel and above, airlines had adjusted their models to allow for that input cost. 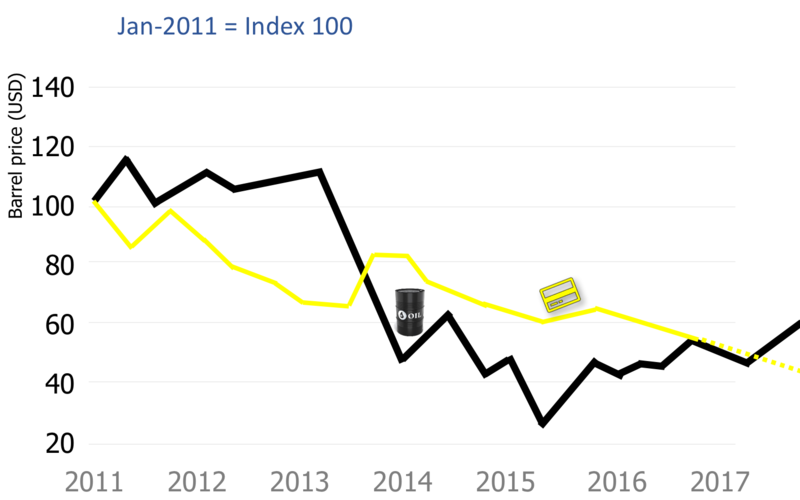 Capacity decisions, including aircraft retirement (or not); route planning; pricing, and staff hiring, were all influenced by the input cost of fuel, when oil prices dropped as low as the mid-USD20s per barrel. Given that aviation fuel costs constitute anything from 20% to 30% – and, for LCCs, even 40% or more – of total cost, a rapid reduction in the barrel price from USD100 to USD30 made a massive difference to the shape of the industry; particularly in an industry which typically enjoys such thin profit margins. That has been a dominant feature shaping the past two to three years of growth internationally. The lower prices have encouraged airlines to retain in service a lot of old aircraft capacity that probably would otherwise have been parked; in many cases too, aircraft utilisation has been ramped up – each action adding further seats into the market. During this period, interest rates have also stagnated at historically low levels, delivering a stimulus on the demand side, and adding to the lower fuel cost to consumers of household and automobile consumption, thus allowing greater disposable income. Sources: CAPA – Centre for Aviation, oilprice.net, The Economist. 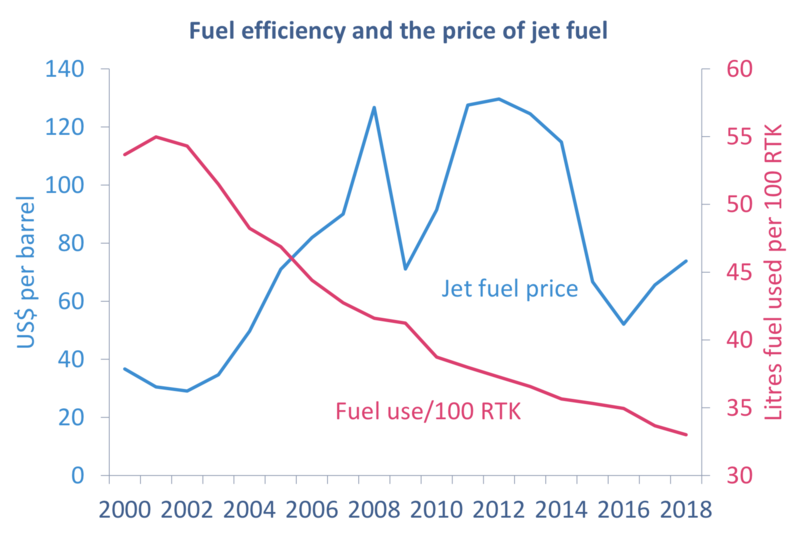 The benefits of lower fuel prices have been further enhanced by greater fuel efficiency being achieved by airlines, both thanks to their efforts to reduce costs and to the growing fuel efficiency of the new aircraft they were operating. 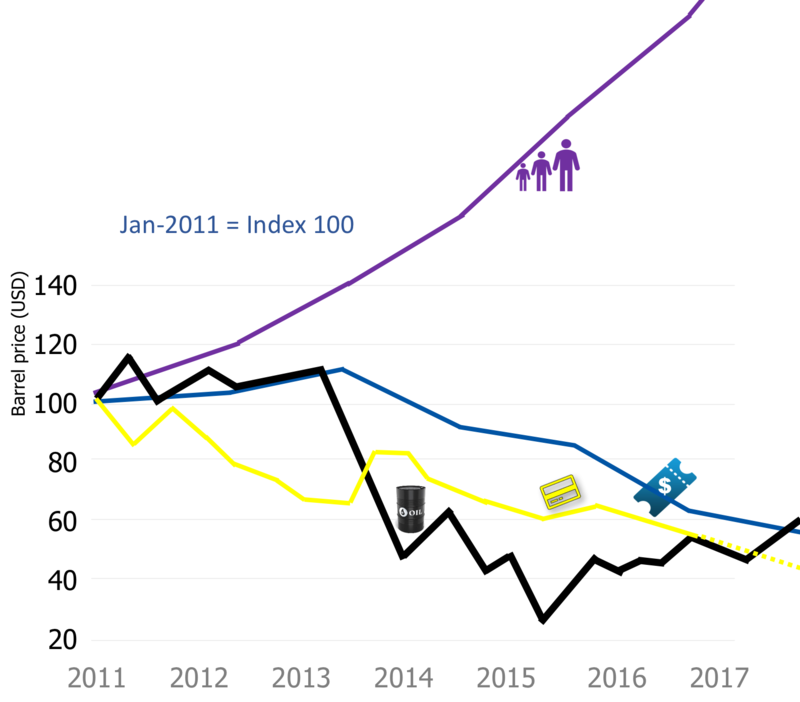 The improvement was significant, giving airlines further leeway to reduce fares, as this IATA graph illustrates clearly. Other short term factors have also been highly influential: the massive growth in the Chinese market and the expansion of Chinese airlines internationally; a range of new aircraft technology which has allowed a transformation in the way global air routes are operated, most notably allowing the expansion of numerous long haul low cost airlines and new routes; a host of new entrant airlines; and, as mentioned above, the synchrony of global economic growth. All of these have contributed to the reason for sustained high levels of traffic internationally. It is hard to escape the conclusion that the relationship between the reduced oil price – and the resulting lower fares – is merely coincidental. Competition has both encouraged new capacity into the market and pressured airlines to pass on the benefits to consumers, rather than pocketing the difference. Sources: CAPA – Centre for Aviation, IATA, oilprice.net, The Economist. Ironically too, this largesse has produced a period of record profitability in the global industry (although the majority of those profits were accrued by a handful of airlines in the tightly held US market). But adding cheap fuel to that fire of new players has created a market even more strongly stimulated by supply driven growth. The danger is that this has been at air fares that may not be sustainable in the long run. That’s because, as this unusual combination of factors has stimulated rapid expansion, it has become an increasingly price sensitive market. One example: at a recent CAPA event an Asian long haul LCC CEO stated that many of his passengers could not afford to buy a meal if it costs as much as USD3. In other words, this is a market where just a few dollars of increase in air fares has the potential to deter a large profile of potential travellers. As a result of this confluence of events, there is a today a much higher proportion of these highly price sensitive travellers than has ever been the case in the past. And that’s dangerous. First in the firing line are typically low cost airlines, as fuel occupies a greater part of their variable costs; but as the market has grown, full service airlines have also come to rely heavily on the bulk low price market segments. Many airlines took advantage of very low fuel prices to hedge their future needs well into 2018, meaning that the impact of higher fuel costs will only phase in gradually; but for those who have not hedged, and are more fully exposed to the increases, the pain will be felt almost immediately. If accompanied by higher interest rates and progressively suppressed demand, the damage is likely to be further compounded. Some supply might be removed from the market – reducing the prospect for traffic growth – but there is little room for airlines to push load factors higher to offset any capacity reductions. Generally, aircraft are flying fuller than ever before. While the lines in the red bar above are only intended as broadly indicative, the general directions are adjustable to a large extent, dependent on how oil prices trend. The bottom line is that we have almost certainly passed the unusual sweet spot of high profitability and high traffic growth experienced in 2017. As fuel prices rise, the industry will once again be in the mode of refocussing to adjust to a new cost and competitive environment. The more they rise, the greater the challenge, as price sensitive discretionary travellers are deterred.